A warm little cabin deep in the snowy woods on the winter solstice.... almost sounds too good to be true, but it certainly is, and here is the story. About the only way to get past the drudgery of living in the poor air quality of a Salt Lake City winter is to make use of skis and heart rate, and head for the hills. 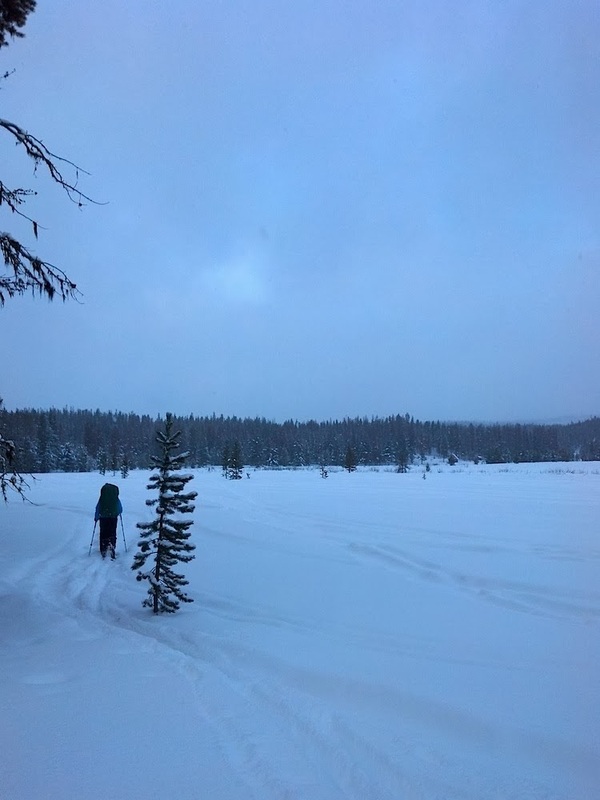 Lisa and I had a long road trip to the Northwest on the books for the holidays, so we made arrangements to break up the drive a bit with a ski/hike into Hogan Cabin to spend a night. We woke at 3am knowing we had the shortest day of the year on our hands, fixed up a fried egg sandwich to go, and rolled out of SLC in a snowstorm an hour later. 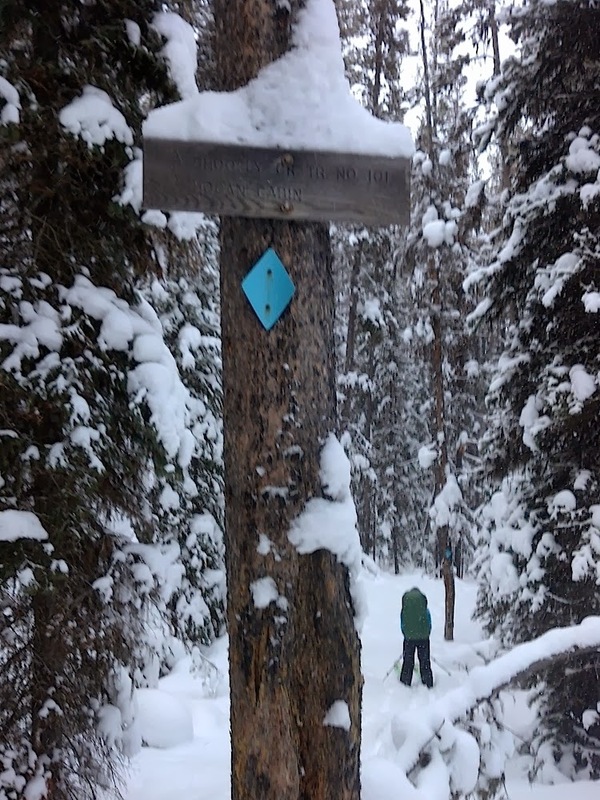 We drove hard and despite nearly 400 miles of snowy roads, made it to the trailhead, near Lost Trail Pass, about 1pm. I'm still not sure that the trailhead is actually a trailhead, but it was the only place that was plowed out so thats where we parked. The supposed TH was about a half mile west of the valley we wanted to ascend to access the Shoo-fly trail. 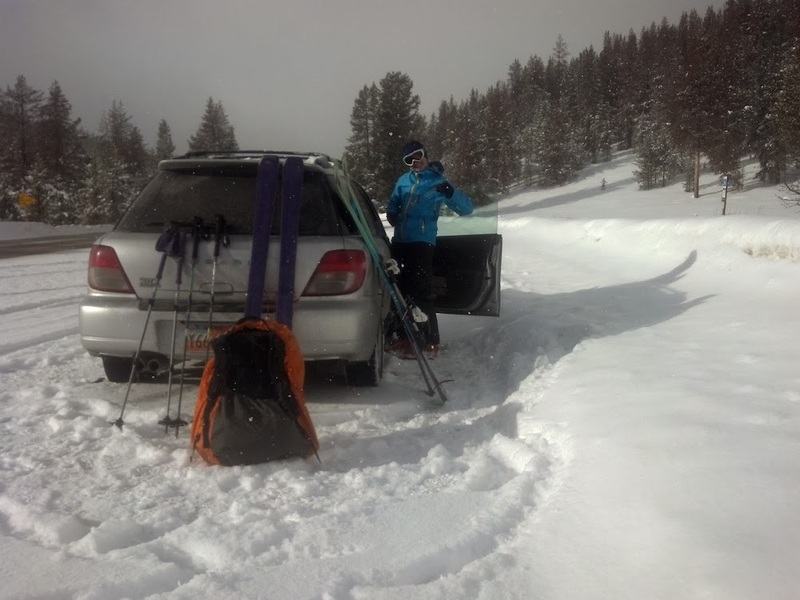 We checked the map and GPS over some lunch, using the car's dashboard as our picnic table, then we geared up and began hiking/skiing in deep snow. Since we began about a half mile west of the valley we wanted to be in we set about, off trail, across a heavily timbered ridge, that brought us out into the beautiful Shoo-fly creek meadow. The first creek crossing was a bit freaky because there wasn't much base under the snow, so it whumped, and fractured, and settled with nearly ever other step. 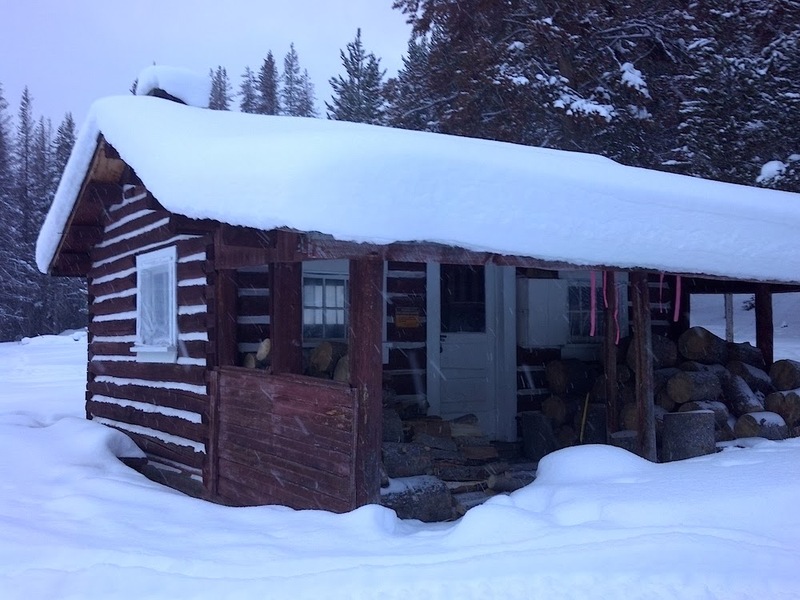 In a later discussion with one of the local snowmobilers we ran into at the cabin we learned that the snow was about 40" of fluff that arrived in one storm a few days prior. Thankfully, there was no avalanche terrain we needed to cross. Once we made it to the north end of Shoo-fly meadow the trail was very well marked and quite easy to follow, although the deep snow made for some tough trail breaking. After an arduous, but wonderful 3 miles through the silence of the forest we came out into the beautiful valley that held the Hogan Cabin. Hiking into Hogan was Lisa's first encounter with backcountry skiing, but thankfully she's strong and doesn't mind a bit of work to reap a special reward. 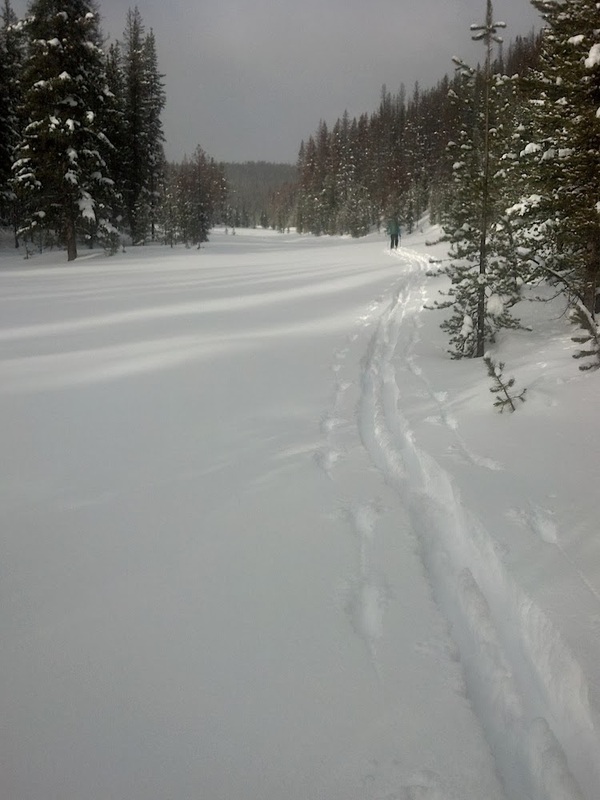 I'd forgotten what an epic workout trail breaking is in deep snow, especially with an overnight backpack. After breaking out of the woods we spotted the cabin from across the meadow and it was as picturesque as can be. The porch was well stocked with good dry lodgepole firewood, which was cracklin' and roaring in the woodstove in no time. 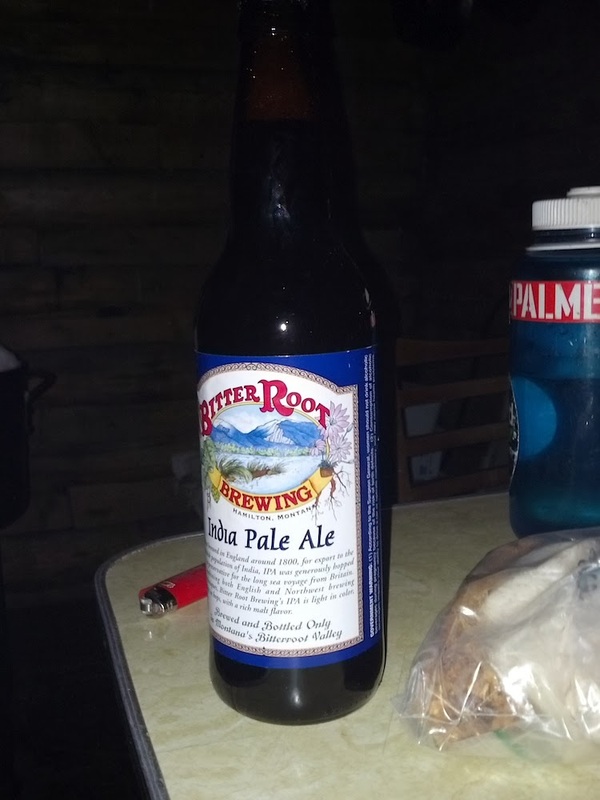 Since I never seem to be one to be concerned with a heavy pack I thankfully stuffed a bottle of good Montana beer in just before locking the car, which we enjoyed as the alpenglow settled on the meadow. 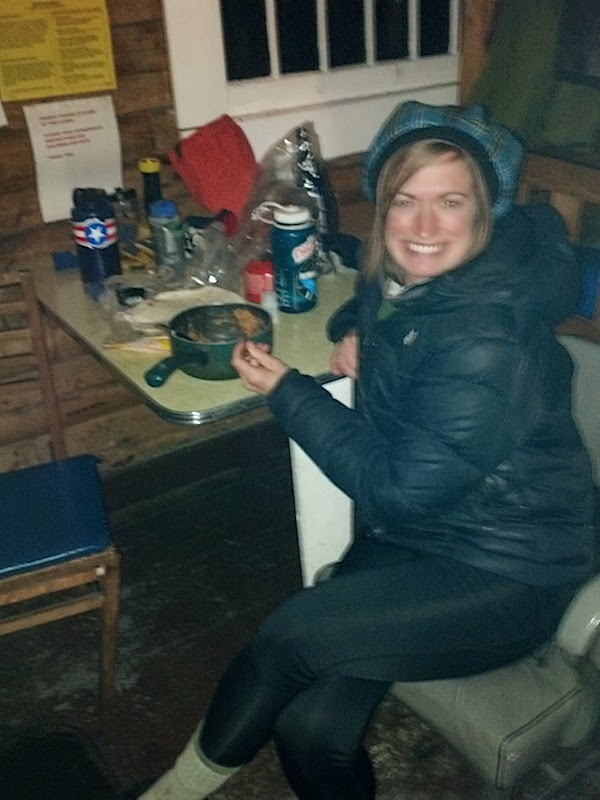 We stoked the fire and set one of the huge pots on the stove to melt snow for later. 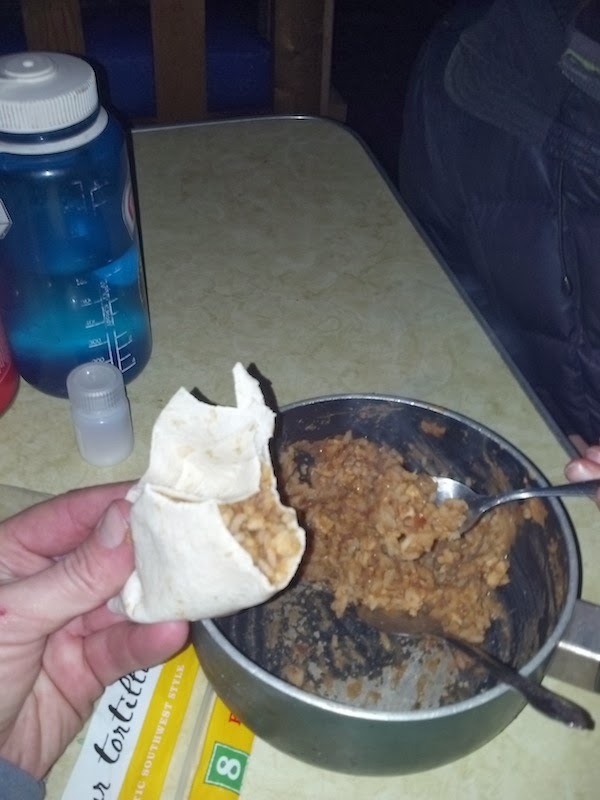 Dinner would be a leftover dehydrated gruel of pea soup with turkey bits that was leftover from the Highline Trail packing. After dinner we celebrated the shortest day of the year with several nips of bourbon whiskey for dessert. The next day, on our return, was a bunch easier since we followed our tracks. Thankfully the car wasn't plowed in either. We loaded up then headed into Missoula to meet a friend at The Old Post pub, which I'd highly recommend for a burger and a beer. I'm super glad the forest service makes this place available to the public. I'm sure it would be easier to just lock it up and forget about it, or worse, to bulldoze it's history into the soil. So, whoever you are out there, thanks for not being paralyzed by some abstract liability, and for being brave enough to do the right thing. Give us a call or drop by sometime, Mick. Same address. Our cabin in the woods is always open.